To celebrate, I folded the mounds of clean laundry that had invaded the living room and nested there for the last several days. And baked cookies with my daughter for her Polar Express pajama party at school today. And watched Glee for the first time in probably 8 months. And haphazardly wrapped some of the multitude of Christmas gifts that must be covered up in the next few days. Today, it’s back to holiday baking. This one was a new challenge for me: biscotti. 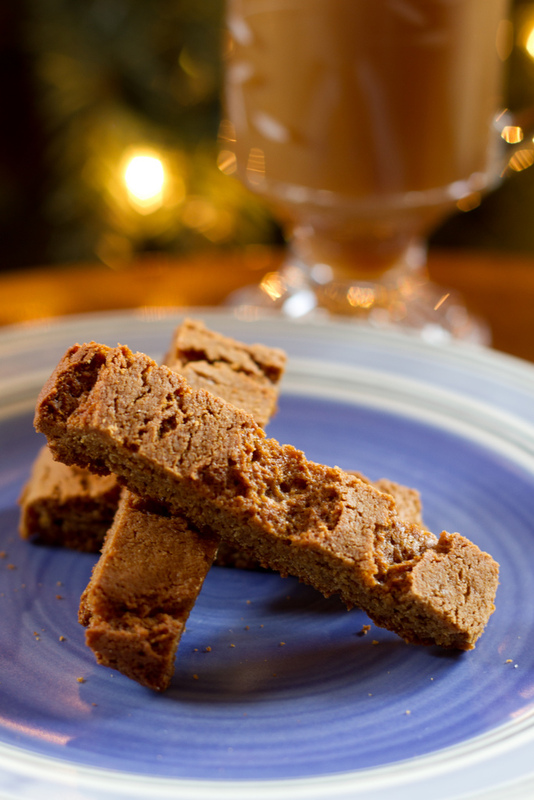 Gingerbread biscotti, to be exact. I never bothered before because hubby is not a fan of biscotti in general, and even less so of gingerbread, but it’s the holidays–a great time to experiment because it’s all for giving away anyway! Now that I know how easy it is to make, I’ll be doing this again…and saving it all for me! Bwah, ha, ha, ha, ha, ha!!!!! Set the oven to 350 degrees Fahrenheit. Line 2 baking sheets with parchment paper and set aside. Cream the softened butter and sugars in the bowl of a stand mixer (or in a large bowl using a hand mixer). Add the eggs, one at a time, mixing until well incorporated. Mix in the molasses. Add the baking powder, baking soda, ground ginger, cinnamon, nutmeg, ground cloves, and salt. Mix slowly for 20 seconds or so, then add the flour gradually. Mix until well incorporated. Lightly flour your workspace, as well as your hands. Scoop all the dough out of the mixing bowl into a mound on the counter and dust lightly with flour. Separate into 4 mounds and shape into thin logs placing 2 logs evenly spaced on each baking sheet. Bake for 20 minutes or until firm on top. Remove from oven and let sit on baking sheet for a couple minutes, then transfer to wire rack to cool for 10 minutes. Reduce oven to 300 degrees Fahrenheit. After 10 minutes, cut each log into 1 inch slices and arrange them on the baking sheets. Bake for 5-8 minutes each on both cut sides (longer for more crispy biscotti, less for more forgiving biscotti), then return to wire rack to cool entirely. These will keep for a while because of the low moisture content. Great for gifting--or enjoying in your own cup of coffee! Delicious! This recipe is featured in the Cookie Plan Monday post on Big Bear’s Wife. What a fun holiday treat! They are! And so perfect for gift-giving! I’ll have to try this biscotti recipe. Calcus is easy, you’ll be fine. I did pass my class, but it was tough. I’m much more language-minded than math. 🙂 Hope you like the biscotti! Good for you on passing the class. I’ll let you know about the biscotti.